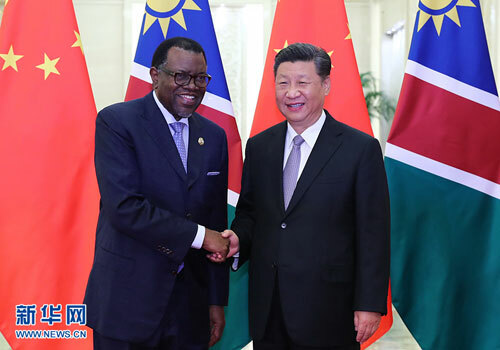 BEIJING, Sept. 2,Chinese President Xi Jinping met with Namibian President Hage Geingob on Sunday ahead of the 2018 Beijing Summit of the Forum on China-Africa Cooperation (FOCAC). 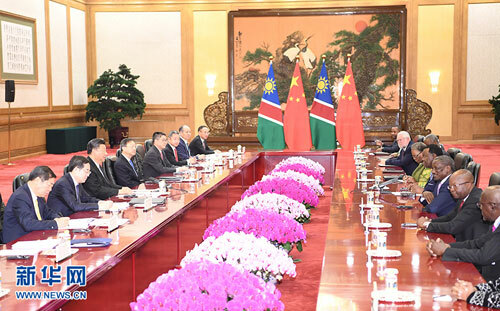 Xi said China and Namibia jointly announced an upgrade of the bilateral relationship to a comprehensive strategic and cooperative partnership during President Geingob's visit to China in March, and an overall planning of cooperation between the two sides has therefore been made. Xi said he is glad that all the consensuses reached by the two sides are being implemented in an orderly manner. China is willing to maintain the momentum of high-level exchanges, and the two sides should understand and support each other on issues involving respective core interests and major concerns, Xi said. Both sides should better align development strategies, deepen mutually beneficial cooperation, and strengthen people-to-people exchanges, Xi said, adding the two countries should promote infrastructure construction and production capacity cooperation within the frameworks of the Belt and Road Initiative and the FOCAC. China supports Namibia in further developing itself and is willing to strengthen communication and coordination in international and regional affairs, Xi said. Geingob said the two sides have been working together for a long time and the upgrade of Namibia-China relations has benefited both countries. Namibia firmly upholds the one-China policy, and thinks positively of the Belt and Road Initiative, believing the initiative is beneficial to connectivity among Asian, African and European countries, and industrialization in Africa, Geingob said. The president also thanked China for its wildlife protection efforts in Namibia. The FOCAC is an important mechanism for enhancing Africa-China cooperation and promoting African development, said Geingob, adding that Namibia is committed to deepening Africa-China mutually beneficial cooperation, and looks forward to the full success of the Beijing summit.